Like more than a dozen other California universities, UC Davis elects student leaders with ranked choice voting (RCV). As a candidate in 2005, I had to reach out to all student voters for whom I might be a first, second or lower choice. This way of campaigning was intriguingly inclusive and centered the campaign around ideas and coalition building. I lost that election, but became a lifelong advocate for RCV. San Franciscans have been using RCV since 2004, and the system will be crucial to next week’s mayoral election. The eight candidates can campaign without fear of “spoilers,” and the winner will need to reach out to voters across our great city. Non-RCV systems often lead to vote splitting, increasing the chance that candidates opposed by most voters will come out on top. Traditional runoffs and California’s Top Two primary system address some of these concerns, but they have proven insufficient compared to RCV due to vote-splitting and the “spoiler effect.” These primary elections can result in November ballots that are missing both the strongest, most representative candidates and longshot candidates who can contribute important ideas to our campaign debate. Even now, political party leaders across the state are sounding the alarm and asking voters to think strategically because of the significant risk of being shut out of general election entirely. Ranked choice voting offers a proven solution for voters. RCV played a key role in last year’s exciting high turnout mayoral and city council wins in Minneapolis and St. Paul by people of color, LGBTQ candidates, and other underrepresented communities. Bay Area’s four cities with RCV have seen significant increases in representation of women and people of color. When San Franciscan first adopted RCV, it led the nation on a plethora of social issues, and voting in a fair, inclusive process is part of that progress. RCV is easy for voters. In San Francisco, we have the opportunity to rank our favorites, and choose two backups should my first choice lose. That power should extended to all voters throughout California and the country. When voters have a greater choice through RCV, election outcomes at all levels become more representative of the electorate. Opponents of RCV say that the system creates confusion, decreases turnout, and disadvantages minority candidates. They may refer to the 2010 mayoral race in Oakland, saying that voters must have been confused by the ballots and elected someone unexpected. While it can be tempting to blame a new system for a politician who loses support, the reality is that polls indicated that the 2010 Oakland mayoral winner would have been favored under any system. True participatory democracy means opening up the field to a variety of candidates. A new FairVote report that analyzes how San Francisco voters engage with RCV found that RCV has in fact increased effective voting in our city’s elections, in part because we no longer need to worry about steep drop off in turnout in runoff elections. Instead, the runoff is built into the rankings. Voter error rates are low and, in fact, errors are higher in the first round of statewide Top Two primary races in Bay Area cities with RCV. 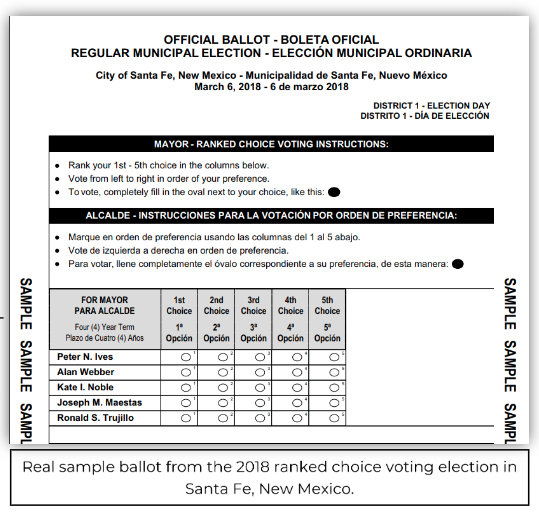 Of course, there’s always room for improvement — ballot design that could be improved. In San Francisco, voters can only rank their top three choices. Allowing voters to rank more candidates on a better designed ballot, as should be available next year, will be a significant step forward. However, what we have is still far better than a “traditional” voting system that limits our voting power. The way our voting systems work is directly connected to the type of representation we get, as well as the needs and values that our elected leaders prioritize during their time in office. Voters deserve to have greater voice in the way they are represented. Ranked choice voting give us that voice, without forcing us to be strategic about choosing who is likeliest to win. I know my vote counts even if my top choice doesn’t win. It’s a clear victory for voters to have RCV in San Francisco. I can’t wait to see what happens in next week, and hope our system inspires others to make their voting processes more inclusive, more cost-efficient, and more fair. This article first appeared at Medium on June 1, 2018.